Sports writers Chad Leistikow and Chris Cuellar break down a must-win for the Hawkeyes as Iowa gets set to face Minnesota. IOWA CITY, Ia. — Two senior quarterbacks, both potential NFL Draft picks. Two teams desperate for a win. C.J. Beathard and Mitch Leidner may only see each other in passing Saturday, but there’s no doubt their imprint will be all over the game when Iowa travels to Minnesota for a crucial Big Ten Conference West division matchup. Neither the Hawkeyes’ Beathard nor the Gophers’ Leidner has been consistently sharp this season. The 11 a.m. game at TCF Bank Stadium gives them a shot at changing the tenor of two seasons on the brink. For Beathard, it’s been a confounding autumn marked by collapsing pockets and diminishing confidence. 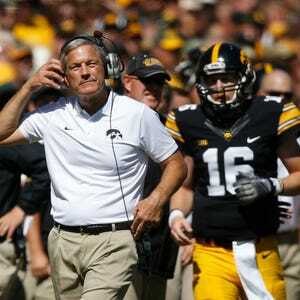 Iowa (3-2, 1-1 Big Ten Conference) has lost two of its past three games and one more setback at the midway point of the season would practically erase the Hawkeyes’ chance of repeating as Big Ten West champions. Beathard has completed 74-of-120 passes (61.7 percent) for 945 yards and nine touchdowns. He has been intercepted only twice, but sacked another 14 and is much more hesitant to run with the ball than he was during a breakout junior season. Hence the lingering questions about his health. Iowa coach Kirk Ferentz pronounced Beathard healthy this week. Beathard himself continued to insist that the Hawkeyes are close to a turnaround. “If everyone amps up their game a little bit, plays a little bit better, then the entire team will get better,” he said. Leidner, meanwhile, is 73-of-116 (62.9 percent) for 840 yards and five touchdowns through four games. The Gophers won the first three in the nonconference, but lost a late lead at Penn State last Saturday before falling in overtime. In the extra session, Leidner took a second-down sack (one of only three he’s absorbed this year) and then failed to connect with top wide receiver Drew Wolitarsky on third down as Minnesota settled for a field goal. Leidner stands 6-foot-4, 230 pounds, slightly bigger than any of Iowa’s starting linebackers. The three-year team captain has long offered a tantalizing mix of punishing rushes and a strong arm. He has run for 141 yards and three touchdowns this year, and has 26 in his career. He hasn’t always been accurate with his throws. He took over the all-time completion percentage lead in Gopher history, but sits at just 57.3 heading into Saturday’s game. When the Hawkeyes spoke about Leidner this week, they raved about his leadership as much as his skill set. Jackson compares him stylistically to Pittsburgh Steelers quarterback Ben Roethlisberger, with poorer throwing mechanics. “His hips are too open, he doesn’t step toward the receiver, he throws across his body at times,” Jackson said. What Leidner does have is a superior offensive line, homefield advantage and a seething desire to beat the Hawkeyes. The Gophers rank fourth in the Big Ten by averaging 228 rushing yards per game; the Hawkeyes are allowing an average of 183. If that trend continues, Leidner will be able to set up the play-action passing game and take his shots downfield when Iowa overcommits to stopping the run. As for Leidner’s personal motivation, that goes back to his high school days in Minnesota, when he felt Iowa’s coaches “strung him along” but never offered a scholarship. How much that has factored into his on-field performance against the Hawkeyes is impossible to say, but he has completed 29-of-40 passes for 417 yards and five touchdowns in two starts against Iowa. He also has rushed for 109 yards. Even so, the Hawkeyes won last year’s game at Kinnick Stadium 40-35. Leidner relishes his chance at payback. “No matter what the records (are), no matter what’s going on, there’s always going to be that hatred and that passion towards this game,” he told reporters in Minneapolis this week. Beathard rarely lets his passion show, even when his line leaves him vulnerable to a blitzing linebacker. His teammates see a different side of him in practice. He can blister guys when he feels it’s warranted. Stop running so many deep, long-developing pass routes. Run more hitches, curls, slants and middle screens to let Beathard get the ball out of his hand quicker. Implement the no-huddle offense more frequently. The Hawkeyes had some success with that in the first half of Saturday’s 38-31 loss to Northwestern, then seemed to abandon it. Get Beathard on the move. He has shown great ability to be accurate while passing on the run. That also prevents him from being a stationary target for opposing pass-rushers, who are feasting on a shaky Hawkeye offensive line. Beathard was sacked six times by Northwestern (or twice as many times as Leidner has been brought down all season). That stat is the most troubling for a quarterback, Jackson said. It’s human nature to get jittery after suffering repeated hits, to start looking at the line of scrimmage instead of downfield for potential receivers. Jackson offered some good news for Iowa fans, though. He believes Beathard can rediscover his mojo, particularly against a Minnesota secondary that is beset by injuries and ranks last in the Big Ten, surrendering 255 passing yards per game with only one interception. “Some guys, if you lose your confidence, it’s almost impossible to get it back in the season. That’s not C.J. He’s got some moxie,” Jackson said. Beathard and Leidner are eager to start slinging again. The quarterback who elevates his play the most Saturday will walk off with the Floyd of Rosedale trophy and the knowledge that his team still has a pulse in the conference race. The other will continue to be dogged by the same old questions. The winner gets the pig. The loser gets the lipstick.